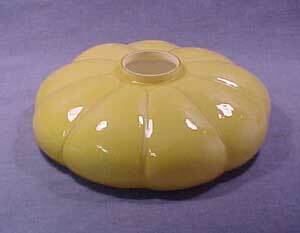 Here for your consideration is a very nice 9 segmented mellon shade with white cased glass interior. The casing is used for good light distribution. 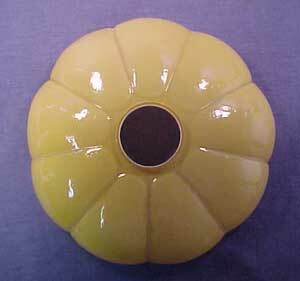 Yellow mellon ribbed cased glass lamp shade. This piece measures 2 3/4" high and is 8 1/4" in diameter. 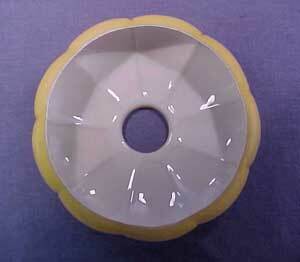 The opening at the top is 1 7/8" inside diameter. Throws off beautiful color. The condition of this piece is excellent however there is some very minor mold roughness on the inside of the rim of the large opening. There are no chips and no cracks.